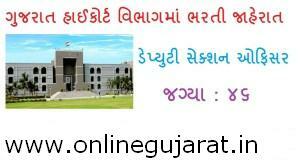 Gujarat High Court HC 46 Deputy Section DySO Details & Information. Educational Qualification of Gujarat High Court HC 46 Deputy Section DySO : as per official Notification. Age Limit : as per official Notification. Selection Process of Gujarat High Court HC 46 Deputy Section DySO : Selection will be based on Computer Based (Online) Examination, Main Written Examination and Viva Voce Test. Application Fee of Gujarat High Court HC 46 Deputy Section DySO : Candidates are required to pay Rs.500/- (Rs.250/- for SC/ST/EBC/PH Candidates) through Cash Voucher at any SBI branches. How to Apply Gujarat High Court Vacancy : Interested candidates may Apply online through the website http://hc-ojas.guj.nic.in/ from 01.09.2017 to 30.09.2017 till 23.59 PM, thereafter website link will be disabled.